Last time, I told you the beginning of my hypnosis story. If you missed it, you’ll find it here. I was browsing Amazon one day in 2011 when I stumbled upon a couple of books about weight loss with hypnosis. It honestly hadn’t occurred to me that this could be an option. I didn’t know anyone who had had hypnosis for anything so it was a pretty foreign concept to me. I ordered the books out of curiosity and was immediately fascinated with the messages within them. On first glance, they were about self-care and healthy portions of simple, non-processed food. But their magic was that they introduced to me the concept of the power of the mind. Or more accurately, the power of the SUBCONSCIOUS mind. I had never seriously thought about what my mind is capable of changing, achieving and improving. For example, I learnt that we have two very different parts of our mind. Willpower and discipline are part of our conscious minds, our ego. That’s why you think that if you decide to go to the gym every day and stop eating chocolate, you’ll be able to do this. However, the REAL boss of your brain is your subconscious mind. Authority figures like parents and teachers programme your subconscious mind from early childhood. And your subconscious mind can sabotage your efforts to change, improve or achieve something new later on in life. For example, when it senses that the status-quo is being changed (like if you were told early on in life that you’ll never be slim). Or if your subconscious mind feels like you’re putting yourself in danger (like if it senses starvation). Or if there is an underlying fear (I won’t like the attention if I become slim and attractive). 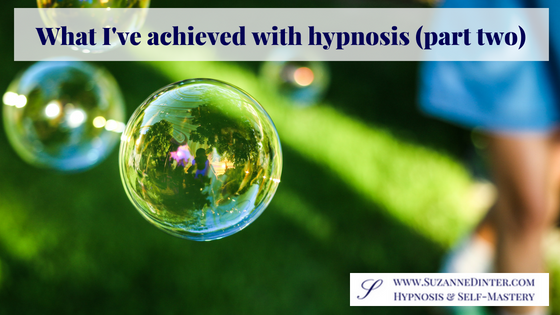 The beauty of hypnosis is that it taps into your subconscious mind when you are in a trance ( deep relaxation). Hypnosis can then be used to find out which stories you’re telling yourself, the ones that are stopping you from achieving your goal. Then you use hypnotic programming (positive suggestions) to reprogramme the subconscious mind. If there is a deep-rooted story, regression (going back to the scene(s) in your childhood to find understanding and clarity) can be used too. Anyway, the books each contained a CD. I listened to them in secret, hoping that no one would question my sanity or judgement for doing something so woo and so selfish (taking time for myself). The CDs were obviously generic and contained simple hypnotic programming. And some of the suggestions I didn’t believe in, such as giving up gluten, dairy and sugar. I mean, I just wanted to become a moderate, selective eater and get back to my ideal weight! But it was fascinating to see that despite the fact that the CDs contained some unsuitable suggestions for me, I lost weight without putting any conscious effort into it. I couldn’t believe it when I got onto the scales every week! And this, my lovely, was the beginning of my love affair with hypnosis, self-belief, the power of the mind, self-mastery, the works! So, what do you want to change? Tell me in the comments and I’ll tell you if hypnosis can help. And if you’re ready to change, improve or ditch something in your life, please see what I can help you with and how here. This is fascinating Suzanne. I love your personal experience about losing weight and am really looking forward to your next instalment. Thanks, Rie. Yes, that’s right. Hypnosis can help with addictions too. This is brilliant. I loved part 1 so I had to read part 2. What a great journey, Suzanne. And now you’re a hypnosis therapist/coach. Well done. Looking forward to the next instalment. Thank you, Claudia. 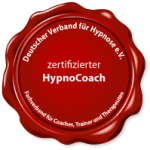 Yep, I just HAD to become a hypnotherapist because I wanted to show other people that they have the power to change too.